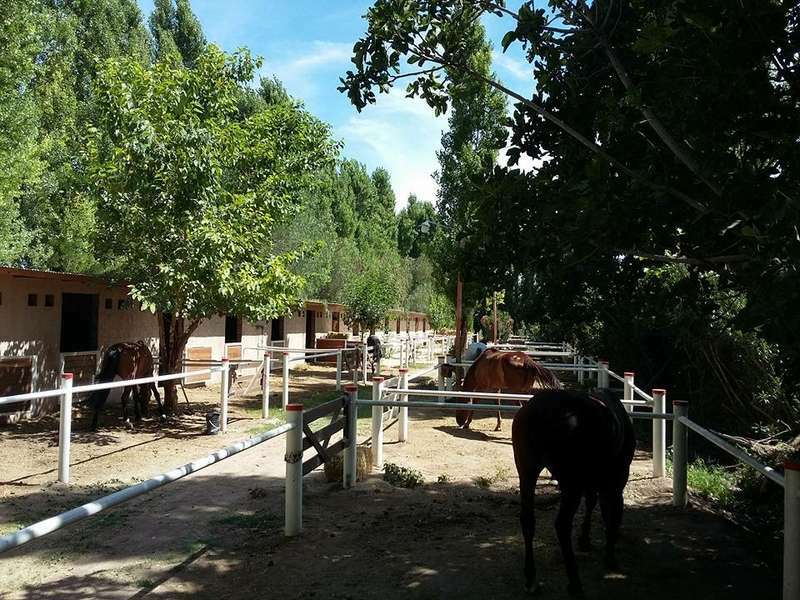 We are a professional thoroughbred stud farm in western Argentina, in a peaceful valley irrigated by melting waters from The Andes mountains range. 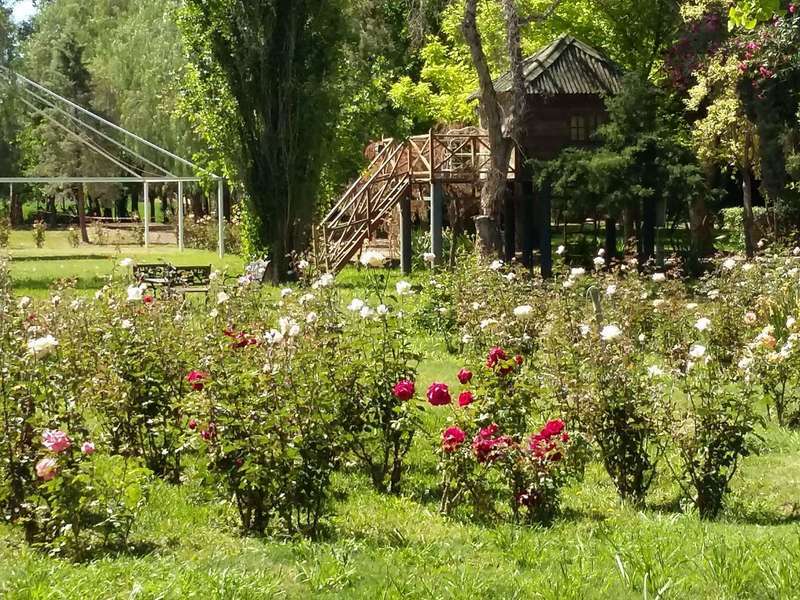 The farm is located in San Juan province, 20 km south of the capital city. The stud facilities are stunning as well as the view of the grassing mares in the alfalfa paddocks at the feet of the mountains. We have lots of horses that are currently in training in a vareity of different disciplines such as Show jumping and dressage as well as a few of them being used as school horses in lessons. Besides, the farm boards and trains horses for other owners. Help is needed in the garden/ farm, horses and in maintaining the place. 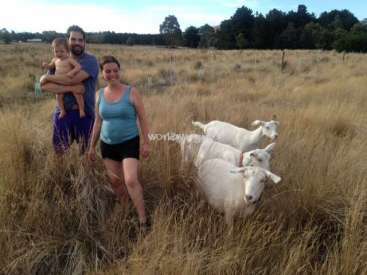 The farm is owned and run by a couple with four children in their teens. They live in the city but have the working offices and a weekend house there so they are usually around. There are also two workers who live in the farm and are always ready for whatever you might need. 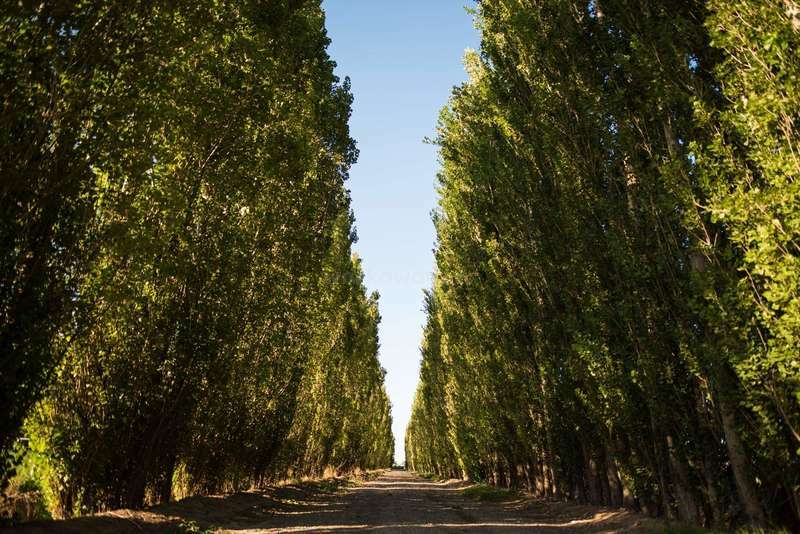 Travelers will benefit working with local staff and customers living in a beautiful rural area nearby a nice town and a capital city, and most importantly, having the opportunity to enjoy interacting with horses and nature in a peaceful farm. This position is for someone who enjoys being outside in nature and doesn’t mind getting their hands dirty. The work ranges from helping in the garden ( weeding, trimming hedges, raking) to helping staff keep up Maintence the arena , building and fixing fences, painting etc. No previous experience is needed just someone willing to work hard. We need help with our horses. We are opened to all levels of riding, you can learn a lot with us and we can also learn from you. It ranges from riding them to cleaning their boxes, the saddles, feeding them and everything we need to do to make them happy horses. The minimum stay is 15 days. You can ask for a free day if you want to go and meet some place. You will live in a confortable and fully equipped house only for workawayers located in the farm and will enjoy complete privacy. The bedroom will be shared by the workawayers and therefore may be mixed male and female, if you have an issue with this please let us know and we can try to arrange an alternative sleeping arrangement. There is current/potable water, electricity, satellite TV and air conditioner. You will be provided with breakfast and lunch the days you work. San Juan is a western province in Argentina and the Villa Aberastain, located only two kilometers from the farm, is the head city of the department Pocito, within the so-called Valley of the Tulum, the main agricultural oasis of the province. Vineyards, olive groves and vegetable fields are the main crops around. Only twenty kilometers away you will find the greater San Juan, a modern city with almost half a million inhabitants. The bus stop to San Juan city is walking distance (30 minutes) from the farm. It is therefore very useful if workers buy a sube card before coming this way they will be able to take the bus into the cit. We have bycicles in our farm in case you want to go to the head city of the department. I spent 5 incredible weeks at the farm, it was hard to leave at the end. It was my first workaway experience and I couldn't have wished for a better one. The farm is beautiful, the people are incredibly friendly, the horses and the dogs are lovely I already miss all of them! 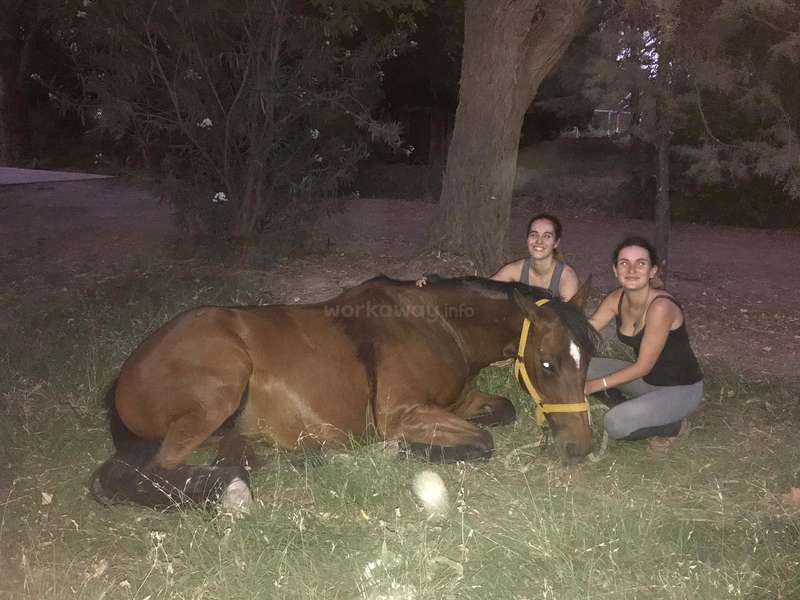 The work starts at 7 in the morning and consists of feeding the horses… read more and giving them water, cleaning the horse facilities and sometimes taking care of the garden and riding the horses. The work is never too hard and always a lot of fun with the staff at the farm who are always smiling and eager to help if you need anything. The horses can be quite energetic as some of them are young or former race horses but I enjoyed riding them a lot. 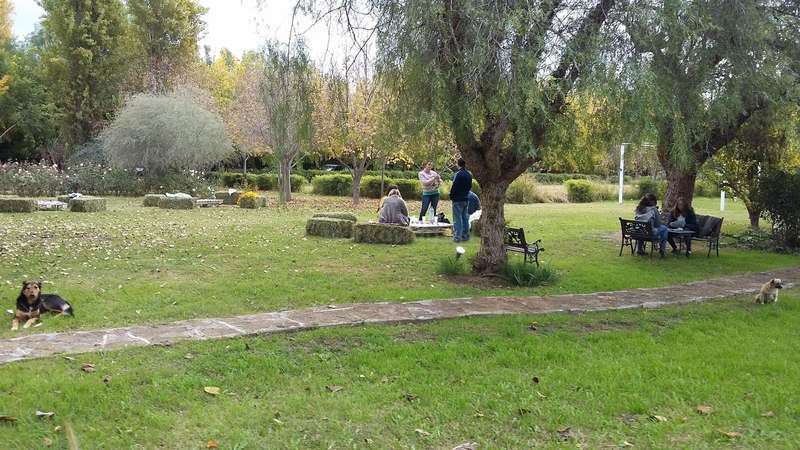 In the afternoon you can relax on the farm or at the house, explore the vineyards and mountains nearby or take the bike to go foodshopping in Pocito which was always an adventure as the some of the dogs followed us until the supermarket. The house for the workawayers is simple but big and comfortable and equipped with everything you need. Claudia always made us feel at home, we were invited to her and her sisters house several times where we spent great weekends. Thanks a lot to everyone for this experience, see you soon! Muchas gracias Ambre! Ya te extrañamos por aquí, y también a Maud. Espero que la estés pasando muy bien donde están. Fue una hermosa semana contigo y entre caballos y jardines. Muchas gracias por su dedicación en el trabajo y con los caballos (además, Ambre habla muchos idiomas, se desarrolla muy bien y es muy agradable y alegre). Esperamos que… read more vuelvan pronto (es un deber) jaja. Saludos a Maud también! Los amamos mucho y siempre están en nuestros corazones. 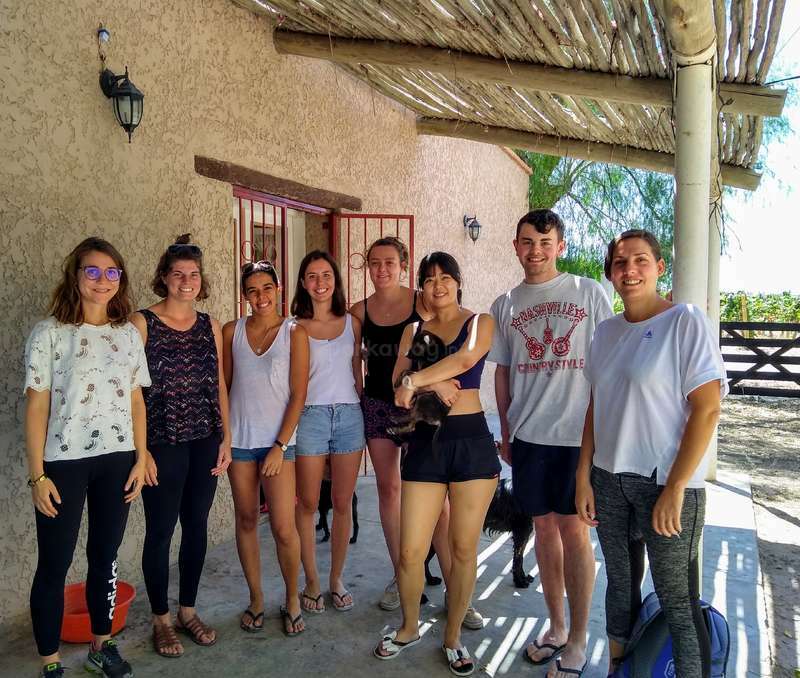 Era mi primera experiencia workaway y la pasé terrible bien.. Tenía que venir por menos de un mes y me quedé 6 semanas ! El lugar es precioso y la gente muy agradable. Cuando me fui teníamos agua caliente, climatización, bicicletas para hacer una vuelta etc. Fue un placer enorme de conocer a "La team" que son increíbles ! Todos más amorosos que… read more los otros. Me van a extrañar muchísimo ! Puedo decir lo mismo de Claudia y las otras personas que conocí allá ! Hacía casi 10 años que no he montado a caballo y gracias a Tonadita me recordé todas esas sensaciones, conexiónes que tenemos con esos animales maravillosos que son los caballos. Uno que se va de acá no puede no hablar de los perritos y cachorros que viven aquí ! Es todo un atracción ! Y como lo dice Claudia, si uno vuelva es por un gran parte porque se enamoró de ellos. Muchas gracias por todos esos recuerdos y nos vemos pronto !! It was really nice having James in our place. He worked very hard with our garden and everything we needed. We will always have our doors open for you James. We miss you and one special dog you named Misty is playing around here asking for you! Thank you and good luck. Spent 1 month on the farm. Enjoyed my stay and would recommend to others, particularly if you want to experience rural Argentinian life. All the people on the farm are friendly and welcoming. If you speak a little Spanish this will help, as the local workers only speak Spanish (but not essential). Accommodation is good for communal living. There… read more is no hot water for showers, but this isn't a problem as San Juan is always hot, so the showers are actually refreshing. There is wifi on the farm, but not at the house, therefore recommend buying a data plan for mobile if you plan to stay more than 2 weeks (Movistar is cheap & you can top up the credit without needing to visit a shop via the app). In your time off you can bike to the local town or wonder around the local area, and at the weekends visit the surrounding area. 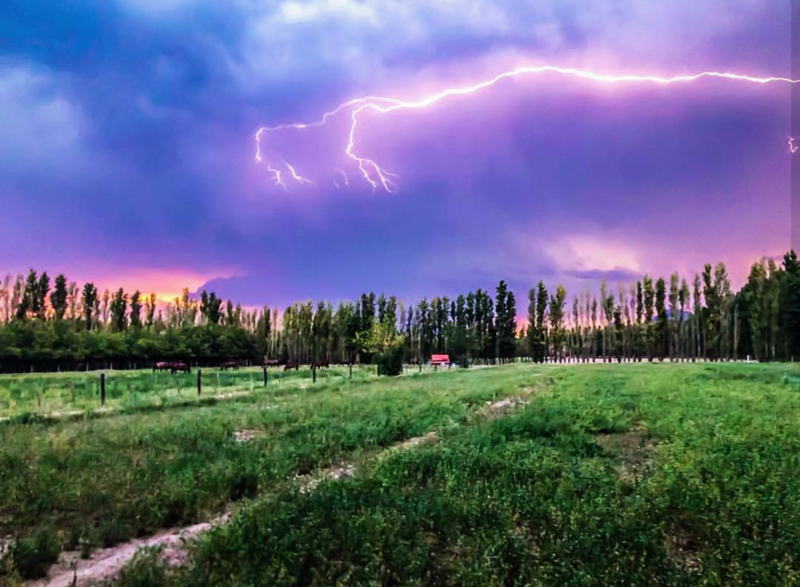 During my time there were some incredible sunsets and also the occasional electrical storm (which provided some amazing photos). On the farm there are probably 20+ dogs that live there. At the house where you live there are 9. You will definitely grow attached to these dogs and by the end of my stay I wanted to take some home with me. They are funny and add a lot of character to the place. The ladies who cook the food are really good, if you have any dietary requirements they will help with this. Thanks to everyone I met and good luck in the future. I spent 5 weeks here, and had an amazing experience. For a first Workaway I could not expect better. I was very well received, the stud staff (who speak only Spanish) are incredibly kind. Claudia (the owner) is very friendly, and I have a lot of friendship with her family, where I have spent weekends sometimes. If you love animal this is "the… read more place to be" there are a lot of horses and a lot of dog that claudia saved from the street and who always asked for love. The accommodation is simple but comfortable, we share rooms of 2 and common rooms with other volunteers which facilitate integration. Breakfast and lunch are included and very very good, evening meals and weekends are our task. The work is usually in the morning either with the horses or in the garden according to the needs. Thanks to every people I met there. We loved having Dmitri in our farm, our experience with him was the best we could have ever had! And we didn't want him to leave. We are going to miss you Dmitri! Thank you for all your help in our farm, for being a good and nice person with all of us! We will always have our doors open for you if you want to come back. Dmitri helped us with… read more everything in our farm, specially with the garden. Our garden is so different since Dmitri came! He is a very nice person and he always took care of the dogs and the house. He worked very hard since the day he arrived and never complained.We hope he comes back one day. We wish you the best in your next experiences Dmitri. We really recommend him. Thank you!! This was my first workaway and it was amazing. Place, people around, horses, dogs, farm workers, owners - everything was just great. I spent 40 days instead of 15 that i planned in the beginning and didn't want to leave. I was working 5to5 as a gardener and able to learn spanish and do some remote work in my free time. Perfect place to chill,… read more connect with nature and animals, have a great company to cook and share dinner, have a quiet lonely walk around farm in the evening. I would agree with previous feedback (by James), if you want to be connected for working/studying or whatever better buy Movistar sim. Worked perfectly for me. I enjoyed my 2 weeks here. I worked solely in the garden, 6 hours a day, 6 days a week. Breakfast and lunch is included but you need to go to the shop/supermarket to get other food. The work is enjoyable, there’s lots of jobs to be done like pruning roses and hedges, removing dead branches, it can be very varied but can be difficult sometimes in… read more the heat. The staff who work there and owners are very friendly and it’s possible to practice Spanish if you make the effort. The workaways stay in their own house, there’s no hot water unless you make a fire but it has air conditioning and a good kitchen. The landscape is beautiful, with a mountain backdrop and because it’s 2km from the main road, it’s peaceful, only the sound of nature. There are also many friendly dogs on the farm, some who stay with you but not in the house. It wasn’t possible to take horse riding lessons as advertised but I was lucky enough to be given some lessons by one of the workaways. We loved having Maxi in our farm. She is a really good worker and she loves animals. It was a nice experience knowing her and we hope to see her again one day!! Thank you Maxi for helping us in our farm. We and our horses will miss you. Have the best of luck travelling around the world! I had a really good time here and stayed for almost 3 weeks. The daily work with the horses was amazing sometimes it’s really hard because of the heat but if you love animals I can truly recommend staying there. Denise, Abel and the Daughters of the owner helped us with every problems we had, showed us some beautiful places around San Juan and… read more the nightlife. You live in your own House with the other workerways and with several dogs (but they are not allowed to go inside). The live is really basic (no hot water/ quite far to supermarket) put perfect for taking a while off of traveling. Sadly we had to say goodbye to Julia a few days ago. It was such a pleasure having Julia volunteer at our place. Julia was always willing to lend a hand no matter what task was asked of her. She did a great job riding our two gaucho ponies and was able to do some ground work with the thoroughbreds. Julia is a bright and open minded individual and… read more was therefore able to improve on her horsemanship skills during her stay here. I recommend Julia, I think she would be a great volunteer in any Workaway program due to her easy going and positive attitude and her willingness to learn. I find it very difficult to write this feedback because I don’t know where to start! The 5 weeks I spent here were absolutely amazing. I learned a lot about horsemanship and horsecare and also about life in Argentina. The accomodation was basic, but I had everything I needed. I was always made to feel very welcome wherever I went, everyone… read more involved here is very nice. I would totally recommend this workaway for everyone who is still in doubt whether to apply and I’d like to say a special thanks to Alice for making my stay the best possible! It was such a pleasure having Maddie stay here for a month. She was great with the horses both on the ground and when riding. She did a great job riding some of our younger horses and was able to improve their flatwork whilst she was here. Always eager to help in any way that she could, she made a great addition to the team. Maddie was also great… read more fun to be around in the house and outside of the the place. She will be greatly missed here by me, the rest of the team and of course all of the horses and dogs! Best wishes Maddie on everything In the future, you will always be more then welcome to came back! I spent the best 4 weeks here with Alice on the farm and loved every bit! The accomodation was very simple but I had everything I needed and the area was stunning! 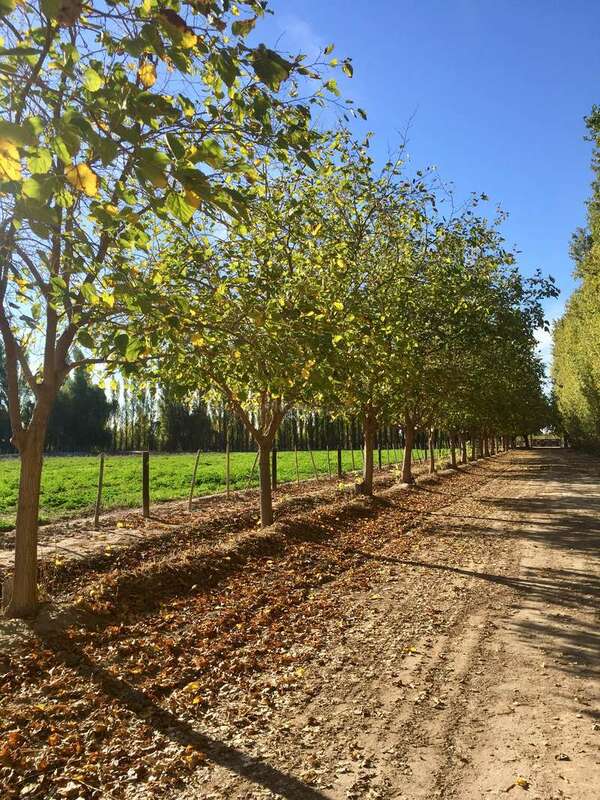 The farm is located at the foot of the Andes and only takes a short walk before you’ve reached beautiful viewpoints of the valley below and the Andes behind. The scenery was incredible… read more with amazing sunrises & sunsets over the vineyards and I was amazed by the differing colours of the mountains each morning! The horses were stunning & very talented, although very difficult to ride. They are very hot blooded horses and so I would definitely recommend you have experience riding before you come. I learnt so much from these horses, not only regarding riding but also training them as youngsters. Alice is so knowledgeable and I can’t thank her enough for all she taught me. I loved riding up to the mountains & hacking around the vineyards as well as training the horses each day. The owner of the farm (Claudia) is so so lovely and really wants to make you feel at home! On many occasions she cooked us asados and took us up to the mountains for walks. 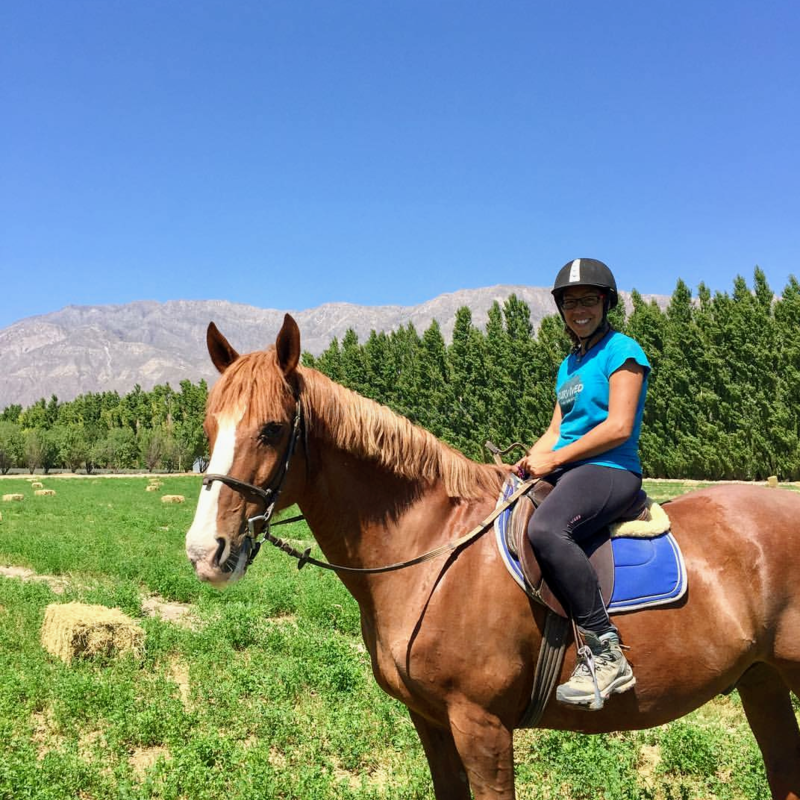 Thank you so much Alice for making my experience so fun, if you are an experienced rider and are keen to learn more about horses I couldn’t recommend this place more! I stayed here for 6 weeks and I had an amazing time. I totally loved it, it is in the middle of nowhere, surrounded by nature. Every morning when I woke up, I was impressed by the wonderful view of the mountains. There was not a single second I was bored. There live about… read more 23 lovely dogs, you can play with and you share your accommodation with Alice, the horsetrainer, I enjoyed the evenings with her a lot. I loved the rides or the walks with all the dogs to the next little,, shop''. The thoroughbreds are very hot and not so easy to ride, so to ride them correctly, you need good riding skills.I tried my best, so Alice offered me to ride the more difficult ones, I learned a lot during my stay here, not only regarding horse riding also a lot about ground work. The way alice works the horses on the ground impressed me a lot. Thank you so much for my time, it was a once in a lifetime experience and I will never forget about it. Miss you so much. Alexa came for 6 weeks and what a great 6 weeks it was. A hard working and positive girl Alexa was a brilliant addition to the team. She was great with the horses which are sometimes not the easiest and she had a good level of riding which meant she was able to help me ride some of the younger and more challenging horses. She was always willing to… read more learn and therefore was able to improve her horsemanship skills during her stay here. She was a pleasure to be around both at volunteering and at the house and she will be missed here very much. I would recommend Alexa any day for any horse related task she would be an asset to any yard and they would be lucky to have such a lovely person stay with them. Best wishes for the rest of you travels. Smart girl Audrey! I have to say that Audrey´s two months here where the most productive ones in terms of volunteers help and horses training. It is also true that she has the best partners to team up and make a difference. First I was Emily and Javier, an American couple, and then Charles, an English young guy. Above being a finance graduate,… read more Audrey is a horse girl. Her first week here she was living in a little apartment next to the horses and she was happy with her new almost roommates. She immediately showed great horsemanship skills in dressage and also jumping (unexpectedly) when we visit an equestrian club. She was also proactive and asked for permission to start working a couple of two years old mares and six yearlings. One of these young mares was under saddle in two weeks. There is not a surprise that Audrey became our favorite (and sometimes spoiled) volunteer ever. Besides all these horsemanship skills, she is very kind and has a fine ironic sense of humor. And even though, she doesn´t accept it, she is also a romantic person (I´m being ironic now). I spent two months and I enjoyed this place a lot ! I wanna do my european and ex-finance girl, so my feedback will be really structured (I will try to be fun anyway). Well, there is nothing wrong to say : this is in a really beautifull and clean place. You can admire the sunset going through the moutains (OMG, since… read more when am I romantic ?). The horses are in open or/and indoor boxes. You can go riding inside or outside the farm but if you enjoy practicing dressage, there is a ring to practice some figures and dressage stuff. The house is big and confortable. I really enjoyed a myself-room (after 6 months in dormitory, it's luxury, trust me). There is everything necessary to cook in the kitchen and a TV with a lot of channels in english (I wanna miss my 1 p.m. Dr House program). As it is said in the description : be smart enough to really assess your level. There is nothing wrong with the horses. I rode all of them and none of them are bad or crazy horses BUT they are hot blood and young horses. So they may have, sometimes unprecdictible behaviors. It's important to have some experience to handle with it correctly. I say that for your safety and the one of the horses. I really enjoy Xtreme (if I were in Belgium I would try to buy her lol), the others horses are really great too. I was happy to have the opportunity to work the babies :). You wanna work mostly with the workers there. There is Marcello, an always smiling person, always there to help you. There is also Pitchoune, a really funny person (even if my spanish was terrible, I made progress, I hope). He knows well the horses, he wanna help you to explain you how work daily work. There is also Martin with who you can enjoy some motorbike conversations (private joke). And of course, Fernando, he gonna give you the instructions for working horses and you will enjoy rides with him in the afternoon. So, I use to go working in the morning (7h30 during the hot days, later during the cold ones). I use to help to workers (feeding, nursuring if any needs). I was cleaning also because I really want to work out (the food was so great, so...). Then I was longing some babies and then ride one horse or two in dressage. The afternoon you can help the workers again and then we usually go for an endurance training session with Fernando. There is a break at midday some you can enjoy a siesta if you need (I love siesta). I had a great experience, with the horses but also with the people I met. I really have a high consideration for Fernando, he is a good person, always helpful. He is also really spiritual and has a lot of culture about Argentina. You wanna learn a lot about this amazing country. You will have also the opportunity to meet Cecilia, a person with a beautiful heart and soul ! The owners are Claudia and Gustavo. They are very generous and really funny ! We spend some great nights at restaurant with them. They also gave me the opportunity to do a training competition in jumping (it was amazing). Their daughter practice jumping and she has two beautiful blackies from the stud-farm :). I meet also some workawayers that become friends. I really want to met them again ! We had a lot of fun together and made also a city trip. Thanks a lot all and see you soon ! What a couple! Emily and Javier, along with Audrey, formed a great team. Very good horsemanship, including ring training and field conditioning, also educating two young foals to accept the saddle for the first time, and doing all the groundwork like mucking, feeding, healing and assisting the vet. 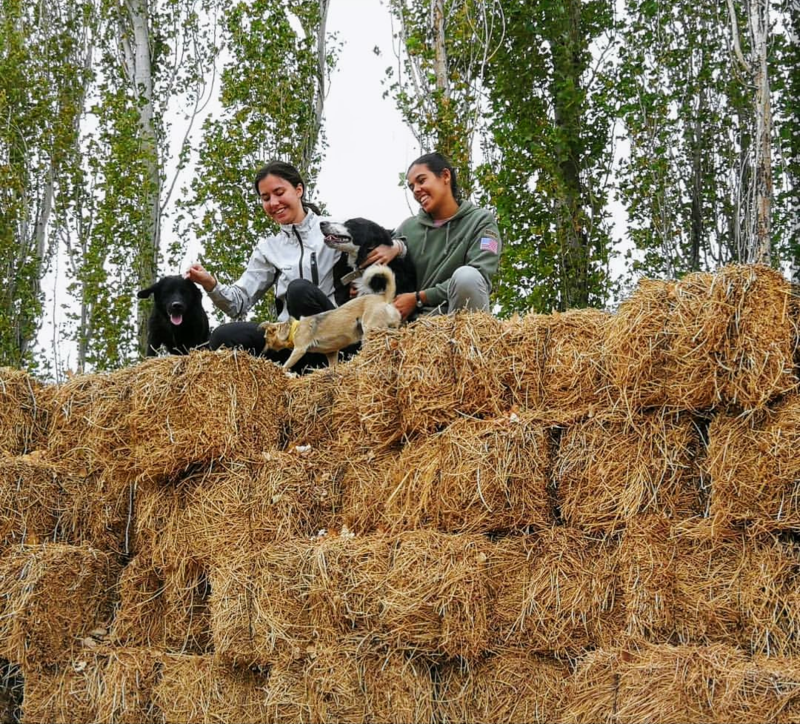 They distributed these activities according to… read more their skills and interests and were a great help for the farm. They are also very nice people to stay with and share things. As they are fluent in Spanish they could also bond with the farm workers and enjoy the daily chat and some typical asados. A new life is waiting in the US and we all wish them the best. Cheers! We had a wonderful time at the farm - the grounds and horses are beautiful, well-maintained, and clearly cared for. Fernando is kind and generous and was more than willing to give advice, rides to town, and show us around several times. He was focused on making sure we felt comfortable and part of the team at the stable, from offering his… read more apartment for a quick nap upon our arrival to a drop-off at the terminal today upon our departure. Everyone working - staff and owners - is incredibly nice and interested in your wellbeing. Lots of smiles, and it's a big plus if you can speak Spanish as most of the crew at the barn speaks that exclusively. If you can't, the owners and Fernando are fluent in English as well, and you'll get a lot of practice. The horses are lovely. 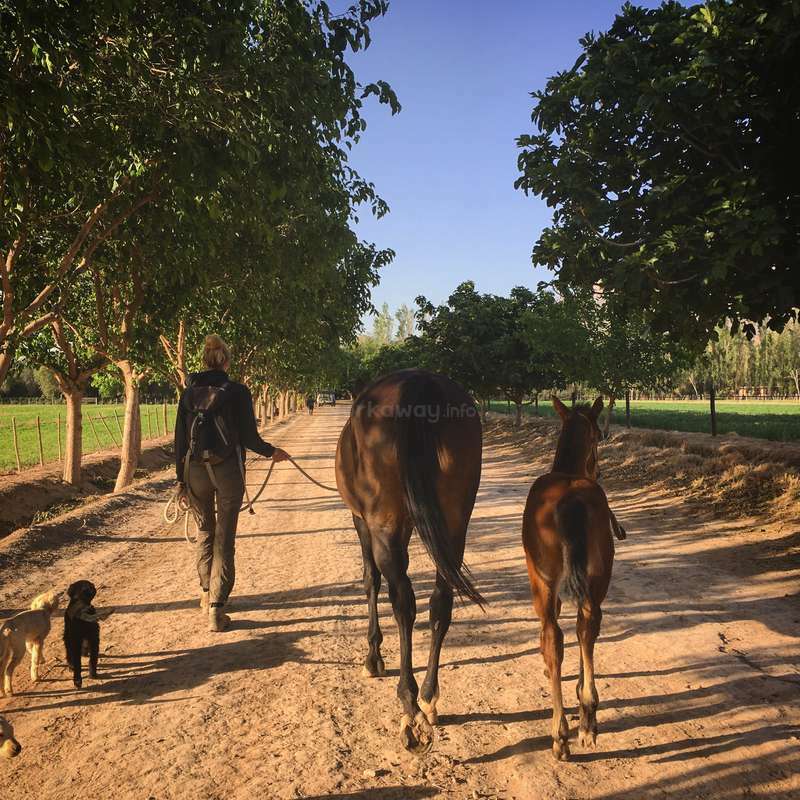 You will need to have some experience, as this is a stud farm and the horses are generally thoroughbreds and specifically OTTB (off the track) and are therefore energetic. They were a great time for me and Audrey, another workawayer who stayed with us in the house on site, while my husband felt more comfortable with some of the calmer horses and groundwork. The place is very clean and Pablo, the vet, comes multiple times a week to check on the horses. A typical day involved cleaning the corrals, nursing any horses/general check-ups, riding about an hour or two depending on schedule (there is a ring and also a longer course for endurance practice), siesta/lunch, more cleaning and upkeep (general stable work) and then a 7-10 km ride in the afternoon. You should be in good shape! The house is spacious and having TV was a huge luxury, as well as groceries that we ordered. We ate very well in Argentina for sure! It's also easy to get to Mendoza or Santiago as the bus terminal in San Juan and Mendoza airports are conveniently located. To Fernando, Pichón, Martin, Pablo, Claudia, Gustavo, Duilio, Marcelo y Marcelo - muchísima gracias. To all our caballitos y perritos, we already miss you! I spent 3 weeks in february at the farm and enjoyed it a lot. The work with the horses is great: As I am not the most experienced rider, I helped a lot with the horsecare (including cleaning, feeding and some "nursery-jobs"). But I had nevertheless the time to improve my riding-skills by training some of the calmer horses. I am so happy that… read more Fernando, the Manager of the endurance team, gave me the feeling to be a part of the team, even though I probably wasn't the biggest help regarding the endurance activitys. I was also happy to improve my spanish in contact with the farmworkers, which are very kind people! I think it was quite important to be a person who sees, what is to do around the farm and just do it, as there is nowone who's giving you strict orders. Me and the finish couple I live with, had a very independent, well-ordered and relaxed daily-life. In our free time, especially during Siesta, we cooked nice meals, played cards, watched some tv, slept for some hours or read books. Fernando, as well as Gustavo and Claudia, who are the owners of the farm, are very welcoming persons and I want to thank them for a great time! Maren stayed with us for some 20 days. As she said, her riding limited her work at the beginning. She is a very entusiastic young girl and speaks a very good argentinian spanish, what made comunnication much easier for the farm workers and could help with other chores as well. We enjoyed having her here. I really liked the stay at the farm! At first it was a little bit difficult because the horses have a lot of temperant but after a few days i got used to it and than i really enjoyed riding everyday! they let you do your work independently and free! The working hours are normally 6 hours sometimes a bit more but its still fine :) Fernando also is… read more very nice, and his family as well, and cares about the workawayers - he took us to the city, went horseriding with us on the weekends etc. Thanks for the experience, I learned a lot! Having this pretty girl here was great! Steph is a relaxing and spiritual person… and somehow reminded me my daughter who was overseas during this time. Even the mares looked more relaxed being ridden by her. She was alone in the house the last week and seemed to enjoy the experience. All the best and you know you can visit us anytime… and bring… read more your sister as well. My time in the ranch was a great experience! Fernando is responsible for the endurance training and he is a very nice person. From my arrival, he made me directly feel part of the "family". He quickly gave me responsibilities and we worked on a trust-based relationship which made me feel part of the project. The place is suitable for… read more independant and proactive persons. If you are the only volunteer on the ranch and need a social activities every day, you can feel lonely. From my side, I love the independency and going out in the town once in a while. Fernando, as well as Claudia, the owner, brought us few times for dinners. They are very sweet people. They are not living in the ranch full time but made their best to make me feel good. My daily routine was to wake up early (I was there at summer time so we had to work early, then enjoying la siesta), going to greet the horses, then cleaning the stables or helping on vet tasks. The main work is to ride the horses twice per day following the training plan that Fernando is giving and explaining you. The horses are great but you need to be an experiment rider! I wish I can come back soon when it's not summer season and give yoga classes as well. Kippis (cheers) to my Vikings! It was a great experience to have you here. We all learned about each other, our countries and customs. You are very nice people and even though your riding experience was a little short at the beginning (considering these sometimes difficult horses) I have never seen a couple so determined to go forward and overcome… read more these. It finally paid off and we all benefited. It is also true that for this experience to be enjoyable you must be autonomous and task oriented. Not only you were on your own many times but it is also part of my managerial style to encourage people to be proactive. All in all you had a great time together. I hope you sell tons of ice-creams this summer in Finland! Kippis! We stayed there for whole February and the experience was great! Fernando is a good host and took us with him to places on our free time (sundays) to see other things around the area. He also arranged a few asados in the ranch for us whisch was great experience! Fernando is not living in the farm and neither are the owners, so you need to be an… read more independent. For us it was fine because we, us as a couple did fine and we shared our accommodation with one girls also. In the farm there were few spanish workers who are living with their families in the farm. 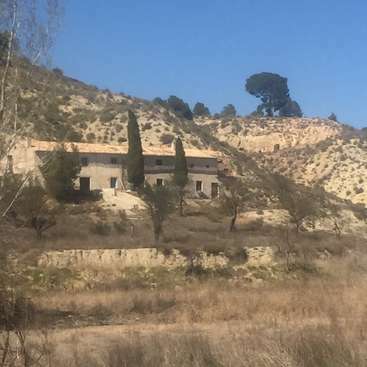 There is no vehicle to use, so it takes about 1 hour (about 4km) to walk to the nearest town (Villa Aberastain), which is quite small though. So this is definitely a good place for couples or very independent persons who wants to improve their riding skills and be around horses, but not the best place for outgoing persons who are not that independent. We are self-reliant persons so this was good place for us because there is no "manager" who is telling you all the time what to do. When we were there there were about 7 horses which we were riding. All the horses are kind with ground work but when you are riding the horses are quite spooky and a little bit unpredictable some times, so they are not horses for beginners. For us the place was perfect because we improved a lot in one month! 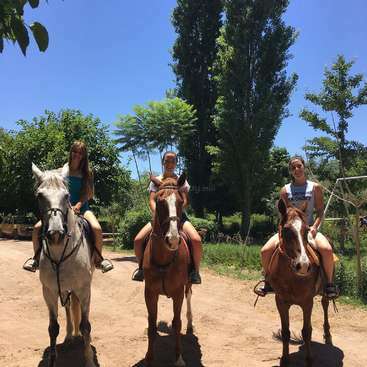 In total, the people are very nice and we had so much fun time with them, farm is very beautiful, and trail riding in the middle of vine yards and right next to mountains are the experiences that we will never forget! Thank you Fernando! Karen the Amsterdam´s cowgirl!!!! She and her friend Lisanne were with us in january, a very hot month here in the desert and with the horses just starting the season. Furthermore I took ten days off (run out to the beach) and left them a routine to do just with two days working together. They did very good with the horses and also took care of… read more some weak rescued puppies. Karen is a very experienced traveler and horsewomen besides being educated and fun. Strong personallty and task oriented. Someone you can trust. We spent almost 3 weeks at the ranch and had a great time! We usually started around 7, did some mucking out etc and then went to ride a horse. After that some more chores involving horses until 12 when siësta started. Then by the end of the afternoon another horseride. Especially going into the mountains were great rides! The horses are lovely… read more but a bit hot-headed so this is not a place for novice riders, but a lot of fun for more experienced riders. Communication sometimes was lacking a bit so we weren't always sure what the plan was exactly, but furthermore a reaaly nice workaway! Fernando, the gaucho's and Claudia & Gustavo and their family really try to make the experience as good as possible. Thank you so much guys! As promised I would write down the name of the puppies. It's of course Superman, and the sisters are called Kwispel (the 'round' one) and Ragebol (the one that always looks as if she just came back from a big rave party). Please keep cuddling them for us, we miss them so much! I spent most of my time working at various farm tasks such as cutting wood and moving hay while Whitney helped take care of the horses. She cleaned pens, watered and rode the horses. Beautiful place, fun work and wonderful people. This American couple are really something! Brennan can help with any farm work, even tough ones, with enthusiasm. Whitney is a good rider and and takes good care of the horses. But most importantly, they both are great people to be around with. We became friends and even made a weekend trip to a lake before their departure. Sophie and Minty. Two sweet, well educated and hard working 18 yo english girls. It was a real pleassure to have them with us. They are both good riders, especially Minty, and helped us not only conditioning but also riding two horses at a race. They also became good friends of my 16 yo daugther. Very good job!! As Julia says, she could stay with us only one week... a pity for both parties. Julia is a well educated, tranquil and fun at the same time girl. She speaks three languages very well (english and french native) and has a very multicultural background. Do no hesitate to have her with you if have the chance. I had a great time here. From the start everyone was so welcoming and friendly. The accommodation is great, the best I've had in my workaway experiences. I had a house to myself, 3 bedrooms, kitchen, living room with tv, dining table, so much space. The house is in the grounds, about 5 minutes walking from the horses, and in front of the house was… read more a field with 6 foals and 3 mares. It was so nice and peaceful. The worked changed every day, depending on what had to be done, I spent time with the workers helping with the horses and also the vet, which was interesting, and even painting tables. You can ride everyday which is a definite bonus. I could only stay 1 week, but I would have loved to stay longer if I could. I was very sad to leave and I would definitely recommend it to anyone who loves horses. The petit francaise Marion was our first workaway volunteer and managed to set the bar quite high for the next ones. She was not only enthusiastic and proactive to get involved in all the farm activities but also made us laugh all the time. In other words, Marion gained our hearts and became family while here. It's only a few days I left after this one month wonderful experience! The place is magical, the owners and gauchos were lovely! You stay in a completely furnished house, which is just for you. It's a real pleasure to cross the finca every morning watching the mountain dominating the landscape to meet the workers! Fernando, the manager, is… read more adorable and generous. I'm really thankful for his trust. Voila maintenant quelques jours que je viens de terminer une superbe expérience 1 mois dans un lieu et cadre tout à fait magique ! Los Duenos et les Gauchos sont vraiment adorables ! 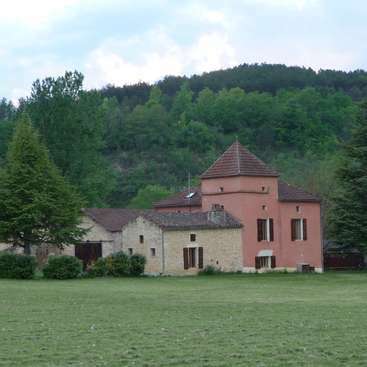 Une maison est mis à notre disposition avec tout le confort possible et c'est un régal que de traverser tous les matins avec la montagne qui domine le paysage pour y rejoindre les travailleurs de la finca. Fernando le manager est tout simplement adorable et généreux ,et je le remercie de m'avoir fait confiance ! 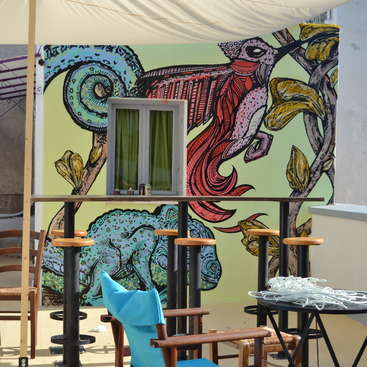 Join our hostel in the old town of Athens, Greece and we will show you around. Receptionist and laundry help wanted.